In today’s world with easy access to the internet, it is very hard to stay ignorant in life. And yet most of us are inexperienced about protecting ourselves on this big web virtual world. If you look around you, every week you will find some horror story of how a Facebook account was hacked or identity was stolen. It may also be about how money was stolen wirelessly. Staying safe online is easy if you know how to use the features that are provided for you. One of these features you need to understand is the difference between WPN and VPN and when to use those. The very first thing is to understand how to secure the way you access information on the net. Generally, when we have a computer, we go through a modem that is connected to your internet service provider, who in turn connects to a server. Then you simply hop on the busy internet highway and stay on it till you reach the destination you are seeking. It is that simple jump on to the internet highway that causes most of the problems; so we have to protect ourselves just before we do that. This is done by selecting the way you want to be seen. For example in Windows, you can set the network either as “Private” or “Public” network. This first time you connect to a network, Windows 10 asks if you prefer your computer to be ‘discoverable’ or not by other computers. Once you make the choice of the network, it helps Windows to understand and select the relevant settings. For, e.g., Windows will behave more secure on Public networks as compared to home networks. Customizing your Windows settings to be public or private network is easy. Let’s see how it works by default. If you are sitting and browsing the internet in a coffee shop then understand that you are on a public network, especially if you are using the free WiFi available there. Naturally, you would not want your computer to be ‘discovered’ by others. This helps to avoid any kind of unwanted file sharing. Hence, by default Windows turns ‘off’ the discovery features. When you are on a private network, Windows enables the network discovery features. With these other devices like your mobile or your laptop can recognize your device. Being on a Private network automatically means that you are on a safe and trusted network. Checking the mode of your PC: Private or Public? 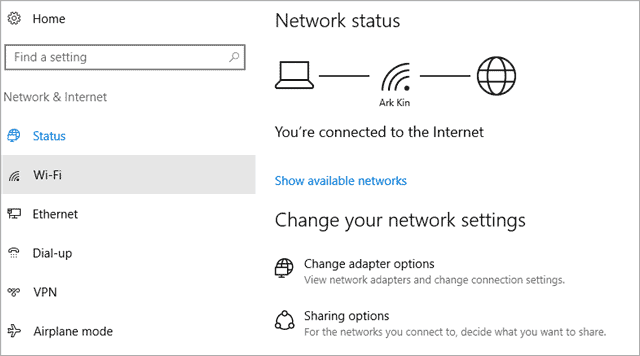 The first time you connect to a network, Windows will always ask you if you want your computer to be discoverable or not. If you select ‘Yes’, then it sets it to Private mode, and if you select ‘No’, then Windows sets the network as Public. To check if the network is in the Public or the Private mode go to the ‘Network and Sharing’ center window in the Control Panel. On Windows 7, you can click the on the ‘Network’ link and set it to “Work Network”, “Public Network”, or “Private Network”. A home network is a private network whereas a Work Network is like a Private Network where the discovery is enabled but Homegroup sharing is not. If you are using a Wi-Fi connection, Launch the Settings app and select “Network and Internet”. Then, click on “Network and Sharing Center”. Now you can see if you are set on public mode or private. VPN (Virtual Private Network) is used to provide security and privacy to public and private networks. VPN is widely used by organizations and corporations to protect the transferring of confidential and sensitive information. The need for e-transfers is very intense given the pressures of running global businesses. Therefore maintaining privacy is of utmost importance, even when you are working from home or a remote area. VPN provides you a layer of security; your IP address gets replaced by an IP from VPN provider. For e.g. even when you are sitting in Amsterdam, but with a VPN, you can appear to be in San Francisco or New York. Ultimately you’re getting privacy related to your geo-presence. Security is the main reason corporations and even small time personal users are switching to VPN networks. VPN uses an advanced encryption method for all online data transfer. Just as we use a Firewall for the security of our computer, in the same way, we use VPN to be absolutely safe on the internet. The core computer users who are quite conscious about internet safety cannot even think of using a computer and the internet without a firewall and VPN network. VPNs can be provided for free or can be paid for. We recommend the Nord VPN that is available for Windows, macOS, Android, iOS. It is a safe and assures complete privacy with double data encryption, with super fast servers and much more. There is a very specific difference between WPN and VPN. A VPN is a private connection to your network which can be accessed from any location. It’s used in big organizations where the employees could be in remote places and yet have access to the in-office network from any location across the world. VPN encrypts all the internet based data to prevent it from being accessed by hackers or any unwanted snooping as you are transferring or procuring your information. Windows Private Network (WPN) is the option that is your first choice when you connect to the wireless network in the very beginning. This is what permits you to control the access to file sharing or discovery features. It also allows you to connect devices that are nearby. VPNs lets you connect from any device and any location around the world and encrypts your outbound data, unlike WPN, which is focused only on your PC. Note: You can have encrypted data in the Private network also with WPA2 encryption. So now that you have understood how to set your computer to Private or Public, and when to access the internet highway through WPN or VPN, we wish you a safe time ahead. In the present world, it is as important to guard your computer with safety measures just like your home’s front door and sometimes even more.